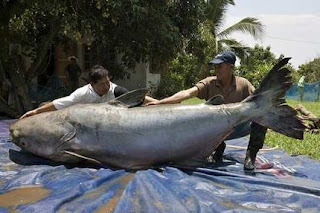 Things grow pretty darn big in Cambodia's Mekong River. 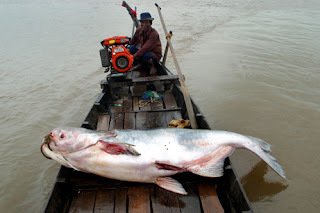 Particularly the catfish (above), which can reach the size of bears. I don't know how people manage to catch these monsters, though I'm pretty sure a fishing rod's involved. But in the southern US, where the catfish aren't exactly tiny, many people prefer to use their hands. I'm not joking. The "sport" is called noodling and involves sticking your hand in the dark underwater crevices where catfish hide and letting the fish nibble on your fingers until you can get a good enough grip to pull one out of the water. Sounds fun, right? But apparently even sane-looking girls get involved in the action--as you'll see in this extremely strange video. I apologize in advance for the music. the guy in the clown suit......why was he in the clown suit??? ?